Brief description: Spiders have eight legs, six to eight eyes, two body regions, and fangs that inject venom. Thousands of species of spiders have been identified around the world, and they live on every land mass except Antarctica. They are often feared but generally safe. Only a few species, including the brown recluse spider and the black widow, pose any true health threat to humans. But even these venomous spiders would rather run and hide than defend themselves by biting. 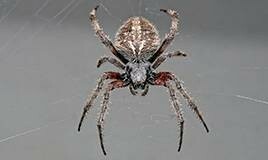 Virtually all spiders are predators that eat insects, other spiders, and any other small animals that they can capture. They cannot chew, but their saliva contains digestive enzymes that helps break down their food before they eat it. Most spiders are able to produce a silk with which they can suspend themselves, spin webs, build egg sacs, construct hunting lassoes and nets, and line their dwellings. This silk is exceptionally strong, elastic, durable and lightweight. Like people’s homes, spiders’ webs can be all different shapes and sizes. They can be orb shaped or funnel shaped. Some webs are more orderly and organized than others. Some spiders do not spin webs at all but take up residence in burrows or outdoor crevices. Females produce an egg sac from which spiderlings emerge. These babies molt several times before reaching their adult form. Spiders can enter the home through open windows or doors or through gaps around windows and doors. They are usually looking for prey. They can also inadvertently find their way indoors when outdoor items or furniture are brought inside the home. Inside and out, spiders like quiet, dark areas. They may choose a corner where there is a plentiful supply of insects. Although most spiders are harmless, most homeowners do not want them invading their space. Their webs can be found along railings, ceilings and quiet corners of indoor and outdoor living spaces. It is important for homeowners to know what dangerous spider species look like, just in case they are faced with one in their home. The brown recluse spider is uncommon in the Northeast United States, but they can arrive here in moving boxes from other parts of the country. They are chocolate brown, with a violin-shaped marking on their back. They get their name from their shy nature. They prefer less trodden spaces such as closets, basements and outdoor woodpiles, and only bite when they feel threatened. Their bites are not always painful, but the spider’s venom can cause a severe, delayed allergic reaction, particularly in children, elderly, and immunocompromised individuals. Symptoms include chills, fever, fatigue, nausea and rash. The affected area can turn gangrenous and fall off. In rare cases, the bite can kill. Black widows can be found all over the United States. They have a distinct red hourglass shape on their abdomen. Like brown recluse spiders, they can bite when they are frightened. Their bite contains a neurotoxin that causes immediate pain at the site followed by pain in other areas, nausea and paralysis of the diaphragm which can make breathing difficult. Most people suffer no serious harm from the spider bite, but among small children, the elderly and sick, a bite can be deadly. Natural spider repellents include peppermint essential oil, which spiders dislike, white vinegar, and citrus. Fill a spray bottle with a mixture of water and peppermint oil or vinegar and spray the cracks and crevices around your home. Clean corners and other spider-friendly spots with a citrus-scented product to turn them away. Keeping your home, porch and yard tidy is another way to prevent spiders from getting too comfortable. Pick up grass clippings and straighten the wood pile where spiders love to hang out. Clean and de-clutter your space to keep spiders on the move.